Let Them Eat Shrimp is a game for two to five fish. Players will swim, spawn and eat shrimp while trying to avoid sharks on the way to a sea worthy victory. 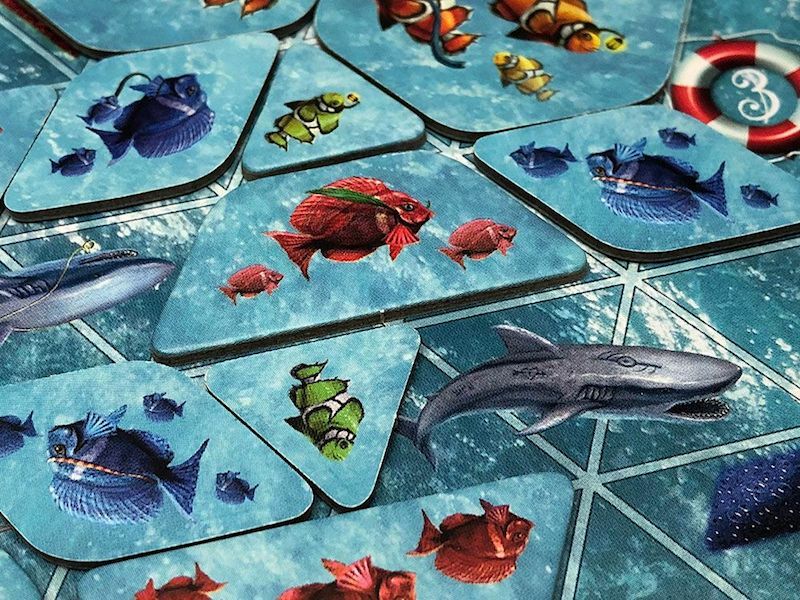 During the game players will place fish tiles to collect sets of different types of fish to score points at the end of the game. The game is designed by Steve Finn with artwork by Giorgio De Michele. We’ll stick with the basic game for this review. Place 3 boards (4-5 players) or 2 boards (2-3 players) connected together to form the ocean. To increase the level of difficulty select the side with more sharks. On each board, drop a green triangle fish tile as the starting tile. Give each player: 4 fish tiles (one of each shape), 3 fish eggs tokens and a player shield. Players place tiles and eggs behind their screens to hide their supply. Remaining tiles and shrimp go into a general supply. Place the die within easy reach and then pick a starting player and dive in. Players place a fish tile on their turn and subsequent action taken based on spaces covered. Placed tiles must touch at least one side of another tile on the board. If a player has no fish tiles in their supply they exchange a fish egg for a tile of their choice, then play the newly selected tile. Players are knocked out for the rest of the game if they cannot play a fish tile legally and have no egg tokens left. Action 1: Take a fish egg or shrimp. If a corresponding fish egg tile (color and shape) is covered, take a matching tile. Same goes for shrimp. Action 2: Starfish – Roll the die for gain. If a starfish space is covered the player rolls the fish die and take the following actions: Fish shape, the player takes the corresponding fish tile from the supply; Starfish, take any fish tile from supply; shark, receive nothing. Action 3: Shark – Roll for loss. When players cover sharks they roll the fish die and the shark devours the fish depicted; starfish loses none. If any of these three conditions are met the game is over. All players are knocked out except one. Remaining player wins. At the start of a players turn, no legal way to play a hexagon tile. 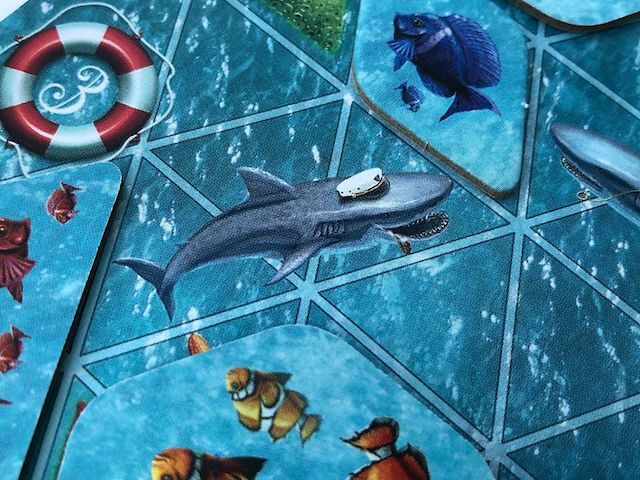 At the start of a players turn there are no sea creatures showing on the board (excluding sharks). Players then score sets of fish. Sets of 4 different fish earn the most points; sets of 3 or 2 fish earn less. Shrimp are worth 2 points. Eggs are used as wilds for complete sets. Let them Eat Shrimp is light, fun, and extremely family friendly. It nailed tile place placement and set collection mechanic cravings for me quite well. Players need to strategize how to best manage their fish supply in order to maximize the amount of set points earned. Keep in mind personal supplies change as players use their own tiles and balancing that is key. Players need to use the very same tiles that award points at the end to get other tiles during the game. My favorite aspect of the game is the decision making of which tile to place for gain, giving complete control of building the personal supply. For example, in some games I collected several green triangle fish tiles, I’d use those to trade one for one closer to end-game to round out the supply. 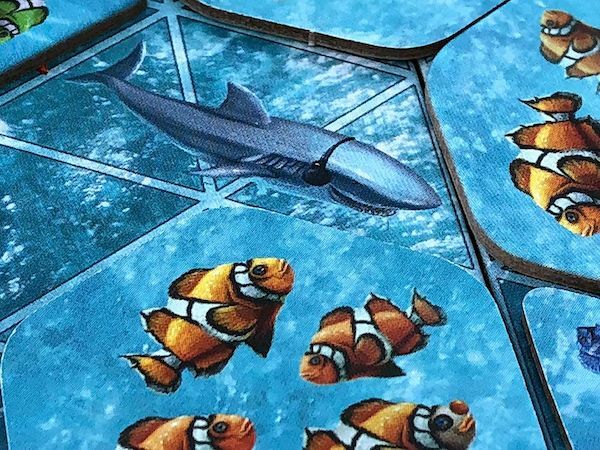 Covering sharks, while dangerous, can net reward of multiple tiles and single tile loss. Trading 1 tile for 3 is totally worth it. When playing with younger children, skip player screens the first few games to help teach them strategy and how set collection works for scoring. Screens also double as a player scoring aid which were a great design choice. The game comes with an advanced mode and additional variants to increase replayability and extend playtime. 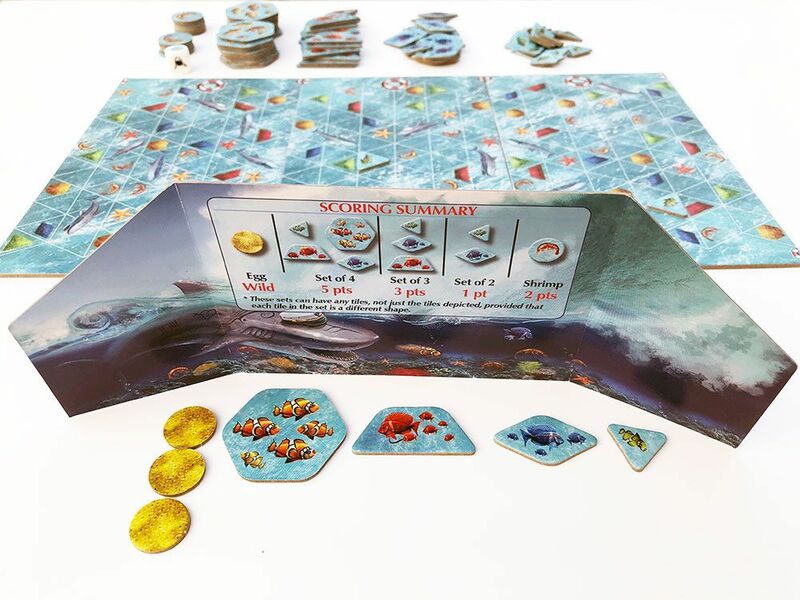 Additionally, double-sided ocean boards adjust the difficulty levels (one side of each board has more shark infested waters). In the advanced mode, the game plays in rounds where players will have to play one of each tile per round, making set collection even more difficult. When a shark is covered, each space it occupies triggers a die roll (up to three). The whimsical art hits the thematic mark. If you look closely, you’ll spy sharks with tattoos and wearing captain hats! Look out for the Easter eggs in some of the fish tiles too. All in all, Let Them Eat Shrimp makes for a great addition to any family game night. Kids will grasp gameplay quickly and give adults a run for their shrimp. I love that there is zero conflict, so it’s a stress free game play. Shape recognition for children. Parent tip: quiz your kids on the shape while playing. Find Let Them Eat Shrimp on Amazon, or ask for it at your friendly local game store. The Family Gamers received a review copy of Let Them Eat Shrimp from Dr. Finn’s Games.